Fennel. Truffles. Peanut Satay. These are flavors one would expect to find at a posh eatery, not while walking down the snack aisle. But those types of tastes are helping shape a gourmet popcorn revolution that’s redefining the salty snack category. And there’s no person who’s tasted more of these mindbending flavors than Kevin Pyles, the man behind the definitive popcorn review source Pop Blog. 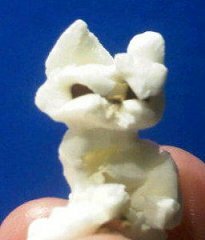 Popcorn expert Kevin Pyles has a gift for finding weird-shaped pieces of popcorn. See more in his Popcornface Gallery. Pyles is bullish on the flavors still to come. “The future is bright for gourmet popcorn,” he says. We asked him to pick a few absolute standouts, then took those flavors to Chicago sommelier and friend of Ribera y Rueda Charles Ford with a Spanish wine challenge: Match these complex combinations with red Ribera del Dueros and white Ruedas. What Ford came up with are pairings that will help you get more out of every handful. For the powerhouse that’s Ten Acres’ Ambrose Popperley’s Wasabi popcorn, Ford leans towards Javier Sanz Verdejo that will calm down the spicy bite. Follow Kevin Pyles on Twitter at @popcornface and follow Charles Ford on Twitter at @charlesthebrstl. Read Kevin’s popcorn reviews at The Pop Blog.